Model of toilet with pigsty (China, Eastern Han dynasty 25–220 AD). A pig toilet (sometimes called a "pig sty latrine") is a simple type of dry toilet consisting of an outhouse mounted over a pigsty, with a chute or hole connecting the two. The pigs consume the feces of the users of the toilet, as well as other food. Pig toilets (Chinese: 猪圈毛坑) were once common in rural China, where a single Chinese ideogram (Chinese: 圂; pinyin: hùn) signifies both "pigsty" and "privy". 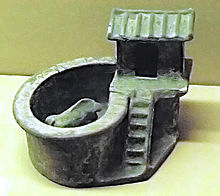 Funerary models of pig toilets from the Han dynasty (206 BC to AD 220) prove that it was an ancient custom. These arrangements have been strongly discouraged by the Chinese authorities in recent years; although as late as 2005, they could still be found in remote northern provinces. Chinese influence may have spread the use of pig toilets to Okinawa (Okinawan: ふーる (fūru) / 風呂) before World War II. Pig toilets were also used in parts of India such as Goa. A 2003 survey of sanitary arrangements in Goa and Kerala found that 22.7% citation needed of the population still used pig toilets. On Jejudo, a volcanic island of South Korea that is home to a breed of black pig, the pig toilets were known as dottongsi (Korean: 돗통시). These pigsty toilets were in use in the 1960s. In China, "Family dwellings are commonly built close to the fish pond with toilets overhanging the pond to facilitate fertilization. ... Some pigsties as well as latrines for humans are built on the adjacent dike so as to overhang the pond." But by 1988, these fish pond toilets were falling out of favour, as the farmers found it more useful to ferment human and pig excrement together, and apply it to the aquaculture ponds as needed. In Vietnam, the traditional fish pond toilet, which was described as "widespread" as recently as 2008, polluted the waterways, but was perceived as more hygienic (less smelly) than various modern alternatives that the government was pressing on the villagers. ^ Sanan, Deepak; Moulik, Soma Ghosh (February 2007). "Community-Led Total Sanitation in Rural Areas: An Approach that Works" (PDF). United Nations Department of Economic and Social Affairs. Water and Sanitation Program - South Asia. p. 5. Retrieved 6 March 2014. ^ "Jeju's black pig still tasty on the table" @ JoongAng Daily, February 15, 2007. ^ Kenneth Ruddle, Gongfu Zhong (1988). Integrated Agriculture-Aquaculture in South China: The Dike-Pond System of the Zhujiang Delta. Cambridge. p. 173. ^ Mader, Philip (12 January 2016). The Political Economy of Microfinance: Financializing Poverty. Springer. p. 144.